Augmented Reality Company, VNTANA, Discusses The Creation of the First Interactive Hologram Karaoke Fan Experience to go on Tour With ROB THOMAS! 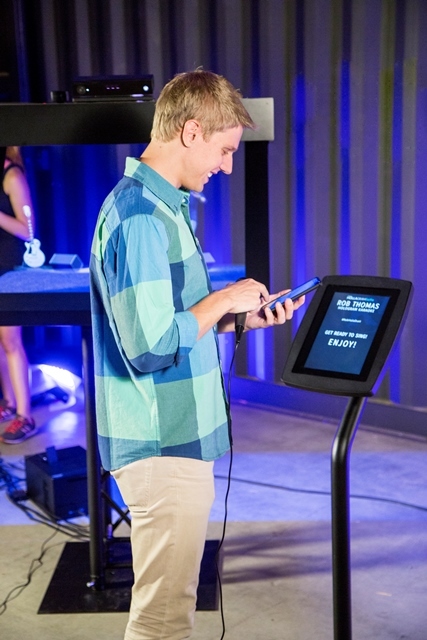 Social augmented reality company, VNTANA, recently announced the creation of the first interactive hologram karaoke fan experience to go on tour with multiple-GRAMMY® Award-winning singer and songwriter Rob Thomas. As a part of the tour’s VIP Package, fans can select one of three songs to perform as a hologram duet with Thomas’ hologram, including the new single, Pieces from Thomas’ 3rd solo album THE GREAT UNKNOWN as well as other favorites One Shot and This is How A Heart Breaks. Fan engagement is a key component in music culture and essential for artists to help create personal experiences for their fans, however, accessibility to artists has recently raised concerns and challenged artists to come up with new ways to engage with fans. Rob was keen to continue to offer his fans a one-on-one experience, and worked with VNTANA to create a virtual meet and greet that still offered close engagement. What can fans expect to see during their HOLLAGRAM karaoke experience? – Fans stand in front of VNTANA’s custom display and within seconds see their own hologram LIVE next to Rob Thomas’ hologram. – As they both appear “on stage,” Thomas’ charismatic hologram invites them to sing a duet with him. – After the hologram performance is done, each fan will receive a video of the experience that they can immediately share with friends and family on social media. Thomas will be co-headlining his North American tour this summer with Counting Crows. The tour will kick off in West Palm Beach, FL on July 22nd, and wraps up in Nashville, TN on Sept. 30th. 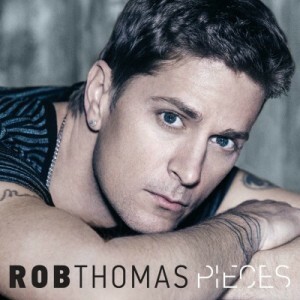 VIP Packages to experience the HOLLAGRAM Karaoke are available now at http://robthomasmusic.com/events. VNTANA is the leader in social augmented reality; creating sharable experiences through its interactive hologram technology. From holographic photo opportunities with your favorite celebrity to gesture controlled drone piloting, VNTANA has built the first and only interactive hologram system with social media integration and data collection capabilities that provide measurable return on investment. VNTANA’s technology has been used by many Fortune 500 brands including Pepsi, Microsoft, Intel, Mercedes-Benz, and is applicable globally across multiple industries including advertising, retail, sports, automotive and education. VNTANA is headquartered in Los Angeles, CA. Visit www.VNTANA.com or follow us @VNTANAlive. Rob Thomas is one of modern music’s most compelling and commercially successful artists. For 20 years, he has been the front man and primary composer for Matchbox Twenty, leading the quintet to multi-platinum success over the course of four albums and a string of No. 1 hits that include “Push,” “3AM,” and “Bent” to name a few. Thomas recently released his 3rd solo album, “The Great Unknown” the follow up to 2005’s platinum-certified No. 1 album “…Something To Be” and 2009’s “cradlesong”. Thomas made history with “…Something to Be” as being the first album by a male artist from a rock or pop group to debut at No. 1 on the Billboard 200. Smooth”, Thomas’ collaboration with Santana was recently named the top all-time track on Billboard’s Adult Pop Songs radio airplay chart, the #2 Pop song of all time and the #1 song of the rock-era by Billboard. Can you please briefly describe what VNTANA is all about? VNTANA is the leader in social augmented reality; creating sharable experiences through its interactive hologram technology. From holographic photo opportunities with your favorite celebrity to gesture controlled drone piloting, VNTANA has built the first and only interactive hologram system with social media integration and data collection capabilities that provide measurable return on investment. VNTANA’s systems combine patent-pending, real-time holographic video capture with interactive gesture control software, allowing consumers to have an augmented reality experience without wearables. The scalable systems create ultra-realistic images in venues ranging from malls to museums to sports stadiums. Until now, many of those venues had been unable to install holographic technology due to the large footprint the technology required, but VNTANA’s systems are scalable to fit a variety of venues. Holographic video capture also had its limitations. In the past, holographic video capture required shooting on a green screen and hours of post-production. VNTANA creates the same engaging experience – live – using depth and body tracking without the need for a studio or green screen.​ ​ Its core product, HOLLAGRAM, combines real-time holographic video capture with interactive gesture control, allowing consumers to experience augmented reality in groups and without wearables. Where did the idea for it first come from? Rob and his team are always at the forefront of emerging technology, looking for ways to provide fans with one-of-kind intimate experiences​. Rob wanted to offer his fans a unique one-on-one experience that incorporated ​hologram technology and that has never been done before. ​We came up with hologram karaoke, and he loved it. How long has this technology been around? Have any artists experimented with it yet? ​VNTANA was founded in August 2012, and introduced HOLLAGRAM Karaoke this year. VNTANA’s technology has been used by other artists, including Paul Oakenfold, Manufactured Superstars and​ Nicky Romero. ​Why was Rob Thomas chosen for this HOLLAGRAM Karaoke? Are any other artists about to go on tour with this as well? ​Rob’s management team, who was familiar with VNTANA’s technology approached us to work with Rob’s upcoming tour to bring something new to his fans. Currently, Rob is the only artist offering hologram karaoke on tour this summer. How’s 2016 treating you so far? How’s your summer been going? What were some of the highlights of 2015 for you? I’VE BEEN OUT ON THE ROAD SINCE REALLY SINCE LATE 2014 SO THE BEGINNING OF THE SUMMER I’VE JUST BEEN ENJOYING BEING AT HOME- SEEING FAMILY AND DOING SOME WRITING. GETTING GEARED UP FOR THE BIG SUMMER TOUR WITH COUNTING CROWS. How did you first get linked up with VNTANA? WE ALWAYS TRY TO DO SOMETHING THAT HASN’T BEEN DONE BEFORE AND TO GIVE OUR BIGGEST FANS AN EXPERIENCE THEY WON’T GET SOMEWHERE ELSE. WHEN WE HEARD ABOUT VNTANA AND THE HOLOGRAM, WE COULDN’T WAIT TO SEE WHAT WE CAN DO WITH IT. IT’S ALREADY AMAZING AND I THINK WE HAVE ONLY TOUCHED THE SURFACE OF THE KIND OF INTERACTION THAT THE FANS WILL BE ABLE TO HAVE WITH IT. Why do you think it’s the right time and place for this kind of technology? OVER THE LAST DECADE OR SO, THE RELATIONSHIP BETWEEN FANS AND THE ARTISTS AND MUSIC THEY LOVE HAS GOTTEN CLOSER BECAUSE OF SOCIAL MEDIA. THIS FEELS LIKE A LOGICAL NEXT STEP IN LETTING THE FAN GET TO PHYSICALLY BE IN THE PERFORMING WORLD AS OPPOSED TO JUST BEING A SPECTATOR. AND WITH A 3 DIMENSIONAL VERSION OF THE ARTIST AND NOT JUST THEIR VOICE. AGAIN, IT’S ALREADY GROUND BREAKING BUT IT’S REALLY ONLY THE BEGINNING OF WHERE IT CAN GO. How did you and VNTANA go about choosing the 3 songs that fans can pick from? Was it difficult to narrow it down to “Pieces,” “One Shot” and “This Is How A Heart Breaks”? PIECES WAS AN EASY CHOICE BECAUSE IT’S THE NEW SINGLE. I WANTED TO DO SOMETHING UPBEAT AND “HEARTBREAKS” IS ALWAYS A LOT OF FUN LIVE. FOR THE OTHER ONE I BELIEVE I PICKED ONE SHOT BECAUSE MY MANAGER REALLY LIKES IT. IT’S REALLY MORE ABOUT THE EXPERIENCE THAN THE SONG. Are you excited to see your fans get to ‘duet’ with you through the HOLLAGRAM Karaoke? I AM. IN THE FUTURE I WOULD LOVE TO DO A HOLOGRAM PERFORMANCE OF MY FULL SOLO BAND SO THE FAN CAN GET THE EXPERIENCE OF FRONTING A FULL BAND. MAYBE EVEN DO A DUET WITH MYSELF. SEE IF I CAN HANG. You’ve toured everywhere so many times so where on this upcoming summer tour are you the most excited to play at? I ALWAYS LOVE SUMMER TOURS. THERE’S A GREAT ENERGY IN AN OUTDOOR CONCERT ON A HOT SUMMER NIGHT. THE EXPERIENCE FOR THE CONCERT GOER AT THOSE SHOWS IS ABOUT MORE THAN JUST THE ARTISTS THEY GO TO SEE. IT’S ABOUT A FUN NIGHT OUT WITH FRIENDS AND THE BAND IS THE SOUNDTRACK FOR THEIR NIGHT. THAT SAID, RED ROCKS IN DENVER, JONES BEACH IN NEW YORK AND THE GREEK IN LA ARE 3 I’M PRETTY EXCITED ABOUT. An Interview With The Talented Young Ladies of L2M! An Interview With FAULKNER, The Alternative Bi-Coastal Band From Brooklyn and Venice.